This review was first published on Fourth & Sycamore. 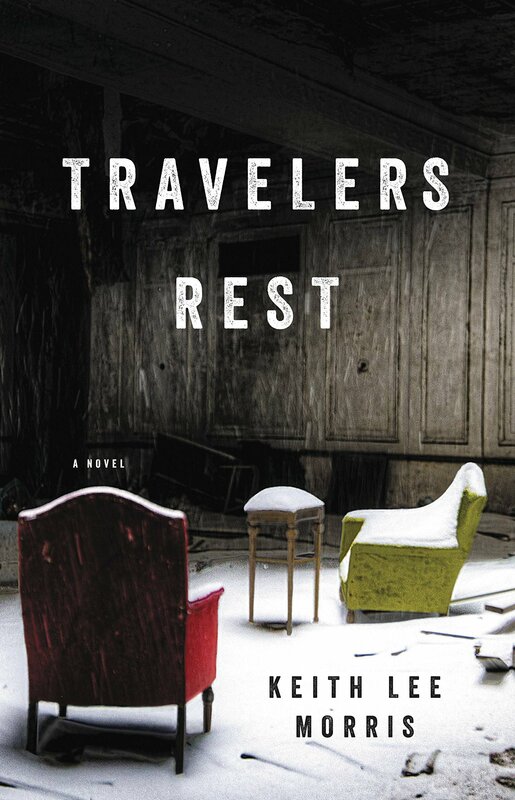 Travelers Rest by Keith Lee Morris is a frozen fever dream swirling together snow, memory, and identity. The novel tells the story of four family members–Tonio Addison, a college professor in his early forties, Julia, his bored wife, Dewey, their precocious ten-year-old son, and Robbie, Tonio’s alcoholic and borderline sociopathic younger brother. The Addisons have driven to Washington state to pick up Robbie from yet another stint in rehab and drive him back to their suburban Charleston, South Carolina, home to, presumably, fix his life and stay clean. Robbie has no eagerness at this prospect and no real interest in getting sober. Tonio and Julia have a relatively peaceful but deeply boring marriage that isn’t so much on the rocks as stuck on a sandbar. Dewey is the kind of strange but prescient child stories like this seem to find good use for. The family hits an intense blizzard as they descend from the Rockies and decides to pull off for the night at the small town of Good Night, Idaho. They leave their car at the bottom of a hill made impassable by the snow and drag their luggage to the town’s only hotel–Travelers Rest. As they enter the hotel’s lobby they notice two things immediately–first, the hotel’s glory days are long past, as the fading, dusty lobby is cluttered with the tools and debris of renovation, and second, those lost glory days really must have been something to behold. The hotel seems impossibly grand for such a small town on such a lonely stretch of highway. A large fireplace, an opulent staircase ascending to a beautiful second floor landing, ornate gas lamps on the walls, and countless other furnishings hint at the hotel’s former splendor, though nothing seems to explain why it all exists in the first place, least of all the curious old gentleman with an oversized moustache and outdated brimmed hat who has no interest in charging them for their stay nor in answering any obvious questions. His name is Tiffany, and he seems to be the man who founded the hotel in 1886. On the very first night, the family members get separated in the hotel, each called apart by unexplained urges until they are each alone. They stay that way, unable to find each other. Something is strange in Good Night, and that strangeness converges inside the walls of Travelers Rest. For most of the book we bounce between each of these four family members as they try to figure out what has gone wrong, where their family members are, where they are, and, as things get progressively weirder and emotional and mental exhaustion brush away their logical objections like so much snow, who they even are, if they exist in reality any longer at all. Its seems time and place are fluid concepts in this place, and each of these characters–Julia and Tonio in particular–begin to morph in waking dreams with historical figures who seem to share their identities. Dewey finds comfort at the diner across the street from the hotel, where he meets Hugh, a man in his thirties who was once orphaned here like Dewey when his mom disappeared into the hotel and was never found again. Robbie shacks up with Stephanie, a young woman who turns out to be Hugh’s sister. Hugh and Stephanie are “souvenirs,” children left behind in Good Night when their parents have lost their duel with existence. It’s difficult for me to imagine any reviewer of Travelers Rest will be able to escape using the descriptor “Lynchian,” so I won’t try to in mine, though I’d welcome efforts to develop or uncover an adjective we can use synonymously to that word so we’re not stuck comparing everything of this style to one eccentric film director. But there’s no escaping it here: this book is Lynchian to such a degree it feels like it might have been written with an adaptation by David Lynch in mind. The story blends domestic drama, distinctly American psychology, eerie settings, strange weather (the snow never does stop falling), paranormal phenomena, and blurred identities into a surreal but strangely recognizable narrative. The titular lodging is a mix of Hotel California, the Grand Budapest Hotel, and the Grand Hotel from Somewhere in Time, but creepier than any of them. No one ever has, but it is implied there is some remote possibility of a trapped individual extricating him or herself from this existential sinkhole. Tiffany offers what vague guidance he can, as do Hugh and Stephanie. It seems this place attracts individuals who are already trapped, who remotely remember some other self they once were and are pulled toward Travelers Rest by an unseen magnetism. If they don’t figure out who they are, they disappear. The hotel is a sort of cosmic and temporal last chance gas station. The novel has a wonderful sense of place, providing a well-envisioned setting that is nonetheless disorienting and eerie. Tunnels connect everything in the town, the snow piles deeper and deeper, walls within the hotel shift. The novel’s environment is simultaneously claustrophobic and atmospheric. Travelers Rest is not without flaws. The four main characters and their relationships feel a little too recognizable, like we’ve read them before. Because of this much of the word count devoted to exploring their inner lives and their relationships feels superfluous, like fat that could have been trimmed. The book could do with some streamlining. Dewey is precocious and not-like-other-ten-year-olds to an extent that feels far too convenient from a storytelling standpoint. Robbie is drawn the clearest, and his personality comes alive the most of the four. Descriptions of his failings provide witty insights into addiction. Keith Lee Morris writes lovely sentences, and his patience in developing scenes and establishing settings and moods is impressive. Travelers Rest blends family drama with a slow-burn sense of supernatural dread and existential curiosity to create a compelling and vivid novel. I’d have preferred it lose some of its excess baggage, but readers are sure to differ on this and no complaints can be lodged with Morris’s prose even in those passages that feel a bit unnecessary. If you find yourself snowed in during the closing months of this winter, Travelers Rest is a great way to wait out the storm.